If your home was on the professional market with a real estate professional and it did not sell you are probably feeling frustrated that you put all the effort and energy into the process only to have a failing experience. I understand that you may be feeling like it's not a possibilty to sell your home but the reality is that there are many factors that can contribute to a successful transaction. 1. The market is ever-changing. With interest rates low and buyers moving into the market the conditions are now ripe for you to get the most amount for your home. 2. Even if it was listed before and it did not sell, it does not mean that it can't! It takes more than putting up the listing on the MLS and waiting for a buyer. 3. Your agent could have been the problem. Each agent is different and they may not of had the marketing plan, marketing dollars or the innovation to get the exposure you needed to get your home sold. 4. A Salability Evaluator was not performed on your property to ensure the best chance for a successful sale. Why didn't your home sell? 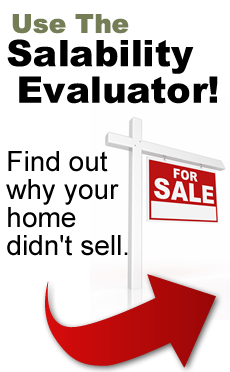 Access the salability evaluator to see if your agent missed key elements to get your home sold.